I am sure you are tired of hearing how busy I am. We all are, right? Nevertheless it is the truth and I certainly don’t have any knitting progress to show you so this is what I have to talk about or not post at all. 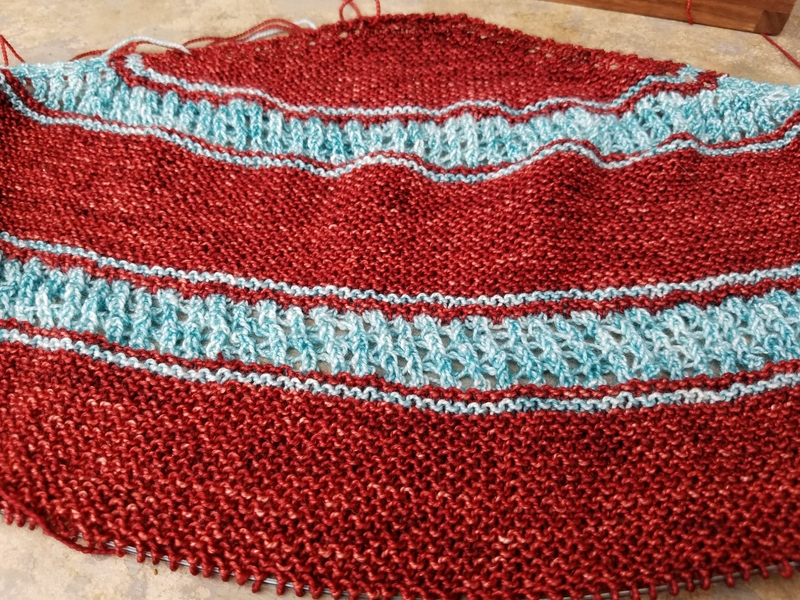 After returning from Yarn Con on April 3rd I have hardly had time to catch my breath. There were over a hundred Yarn Swifts awaiting me to apply finish on and put in bags. Then I had to catch up my records and do some quarterly sales taxes. 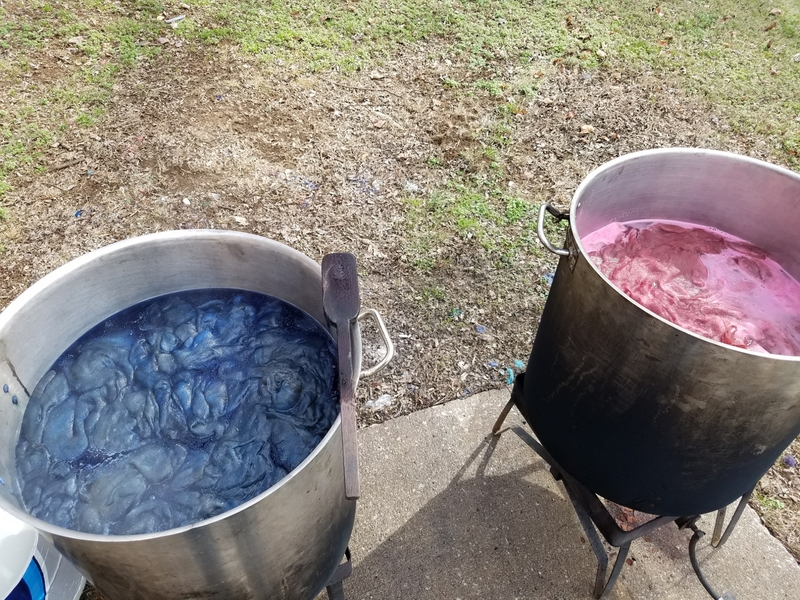 Then after a bit of house cleaning there was dye to prepare for a huge order of yarn arriving soon. 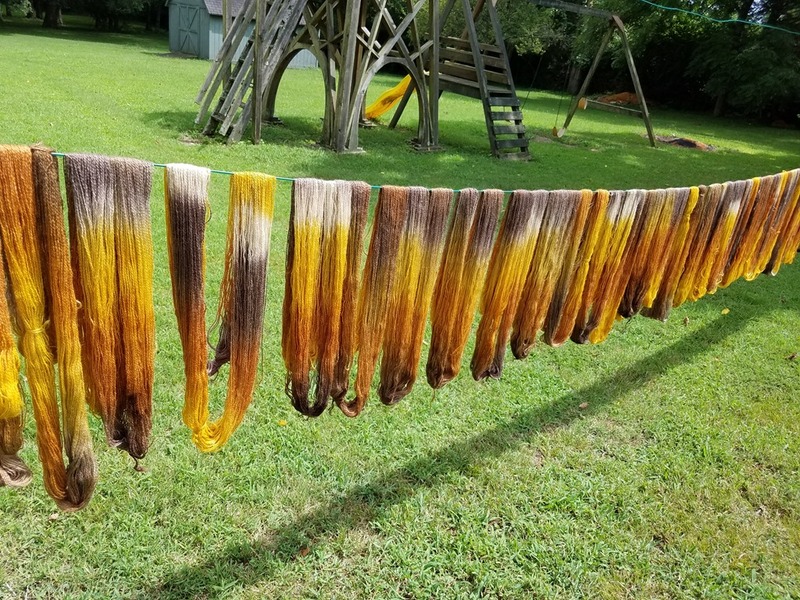 Well, arrive it did, and just as I had completed the dye prep. So that has been wearing me out this week. I am on the last day of that right now. The next couple of days will involve labeling all the yarn and loading it in the trailer. I will be off to Virginia and then Conneticut starting on Thursday the 20th. I will be returning to a spring show in Virginia that I did as my 3rd show ever in 2007. 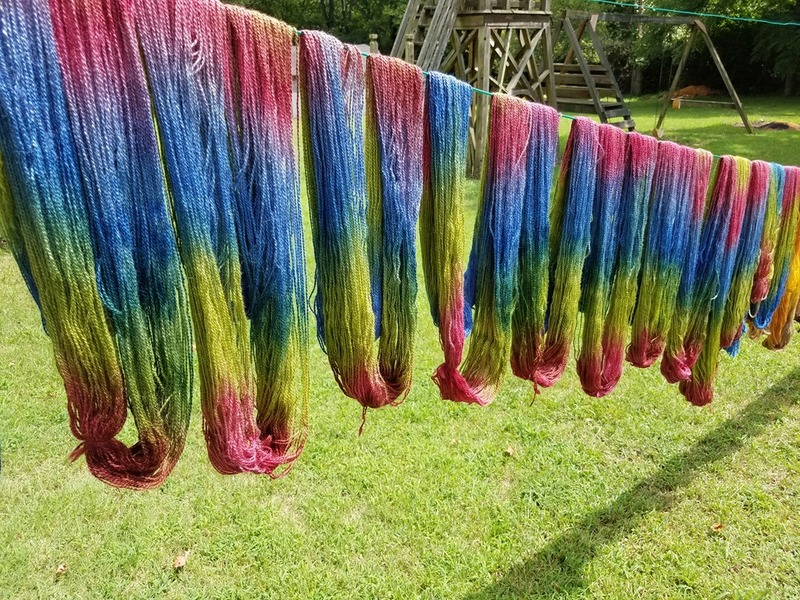 It is now called the Olde Liberty Fiber Faire. It appears they haven’t updated the vendor list for 2017 but I will be there. I am then going to Stitches United in Hartford, CT. This will be my first time to that area. Hope to see some familiar faces from Stitches East as well as lots of new ones. 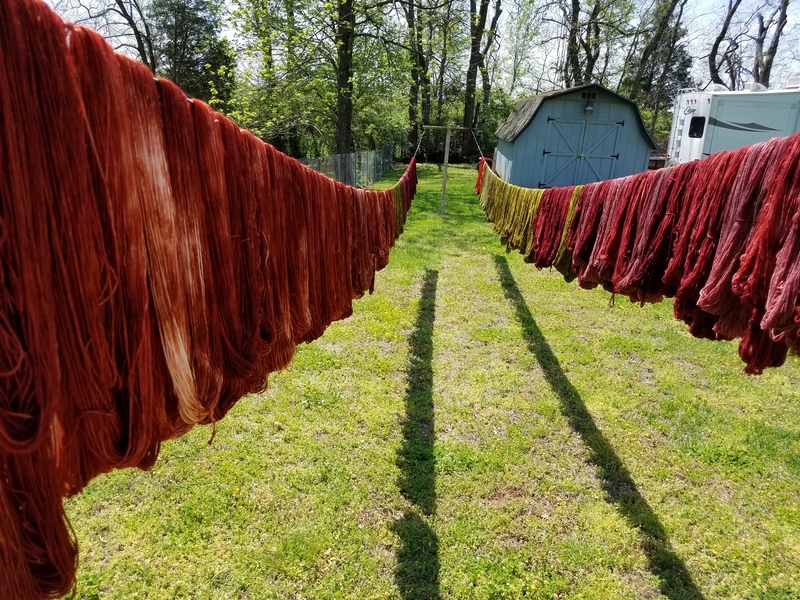 I have a small window of time to write a quick update for you while I am waiting for my dyepots to cook some alpaca fiber today. It is an order for New Era Fiber. Here’s a fun detail about this order; see the blue pot there on your left? 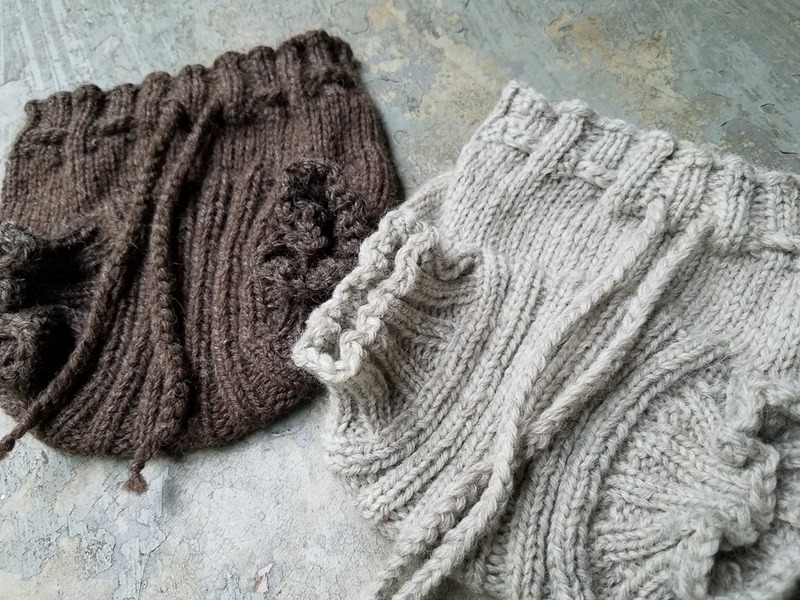 Since I still have 20 more minutes before I have to get the stuff out of the pot I will share a knitting update too. Here’s a picture of the Fallston shawl progress. 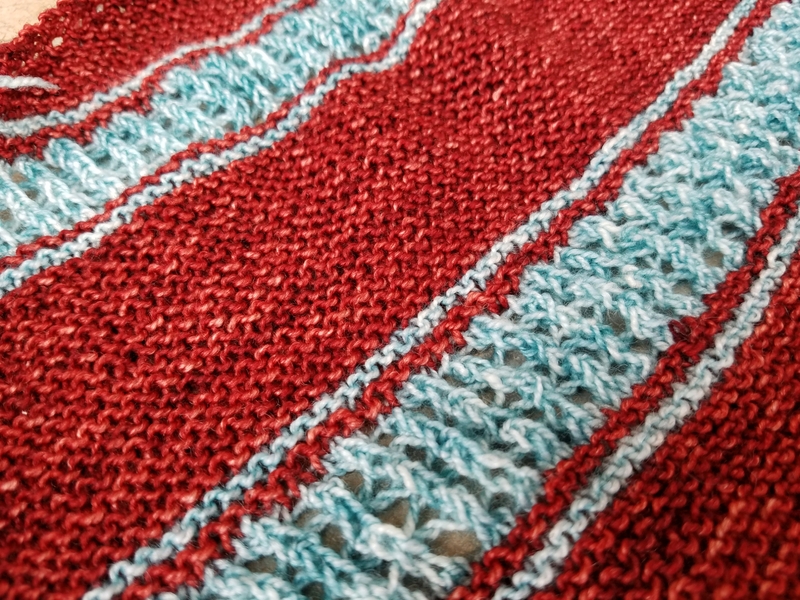 It will get more exciting when I start the border but I do love theses colors together. Okay I need to get back to work. See you soon. I can’t remember if I showed you my finished gloves so here they are just in case. 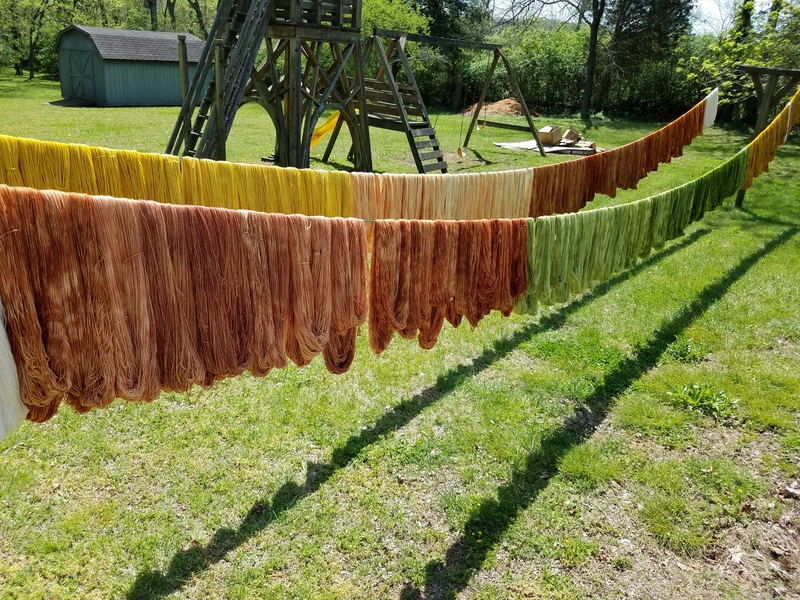 I did some dyeing this past week to do a little restocking of my inventory and while I was at it I dyed up a 30 skein lot of Classic Merino Superwash Sock yarn in a new color I call Robin Egg. 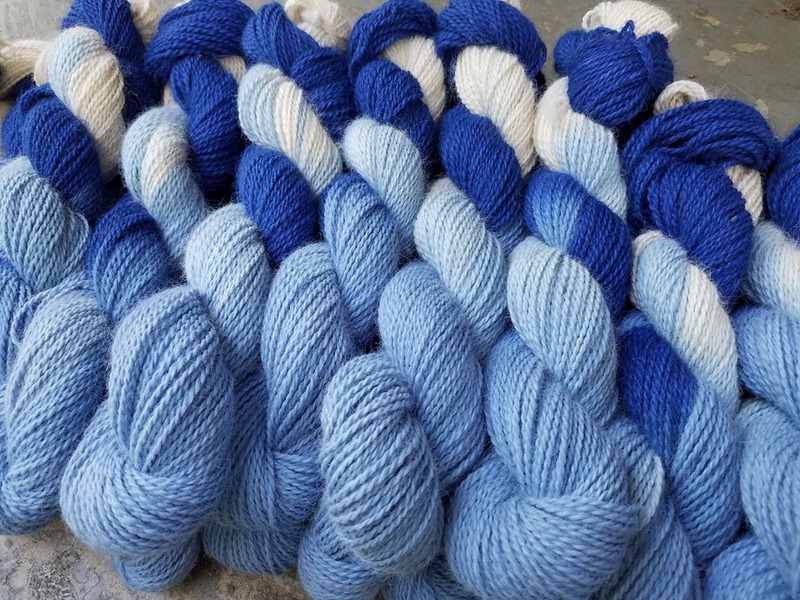 I may be adding this color to all my bases later this year if it does well but for now I have it only in the Sock. I have also cast on for a new shawl design by the lovely Dee O’Keefe called Fallston. 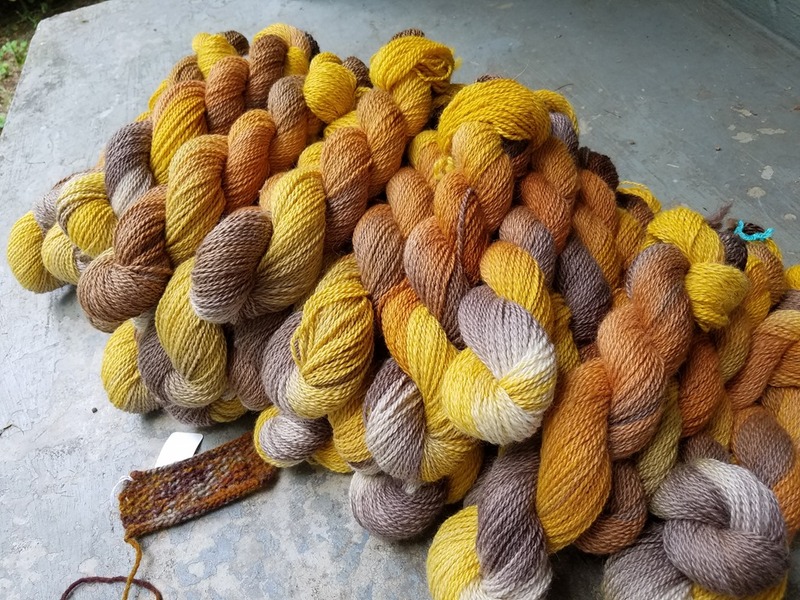 Dee designed this beauty in my Superwash Sock yarn (linked above) this past fall and I was trying to decide what colors I wanted to use for mine. When I dyed the Robin Egg I finally knew. This. This is my Garnet paired with the Robin Egg. I love it! So here is the start of the shawl which has grown some since I took this picture yesterday but it will do for now. I have been trying to find an opportunity to write this post for several days. I returned from Chicago last Monday and every day has been full. I won’t bore with all the details but here is a portion of the fruits of my labor. Knitting first because it is a knitting blog after all, right? 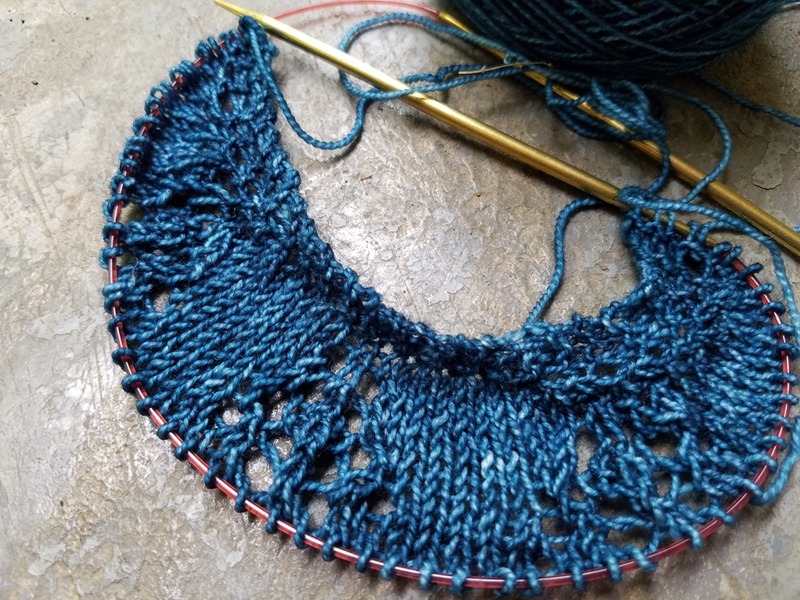 So, I told you I was planning a couple of new lace projects soon and I cast on for the first one a couple days ago. I got the first chart knit. This is one of Dee O’Keefe’s newest releases called Mayuri. 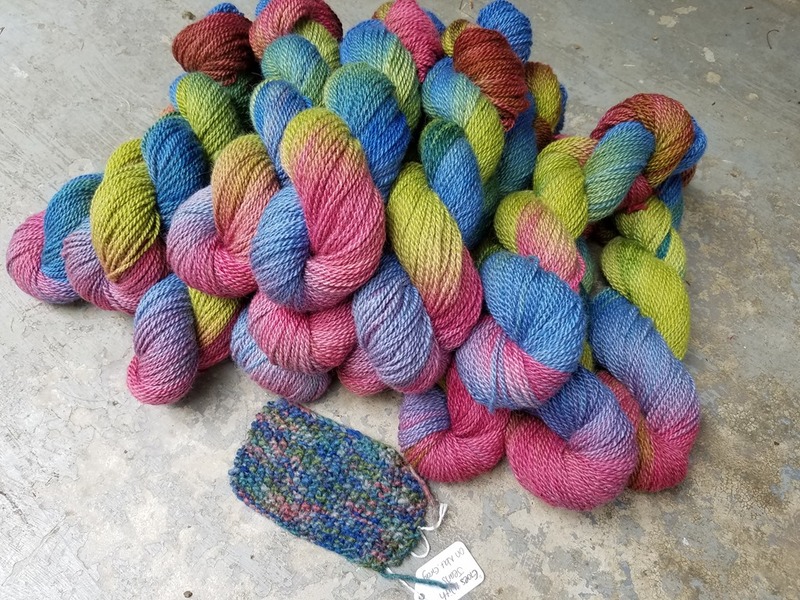 I am making it with my Classic Merino Superwash Sock yarn in one of my new colors, Peacock. The second newborn sized woolie is completed for Meredith’s little one, so that’s another project done. I haven’t much touched the sock in progress this week so nothing new there. 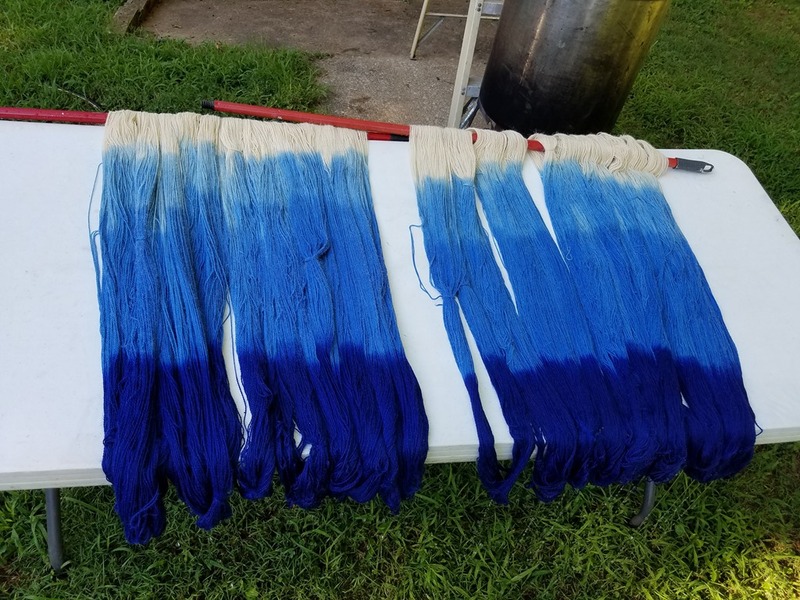 Now the other work I have been doing that may be of interest to you is some custom dyeing for the New Era Fiber Mill, only this job was hand painting some yarn. This top one was an order for an Ombre in blue. I didn’t technically hand paint this like the other two jobs below; I used a progressive dip immersion process. I am pleased with how they came out, which is good because I was totally making it up as I went. I am actually headed out the door to deliver these right now so I will have to close. 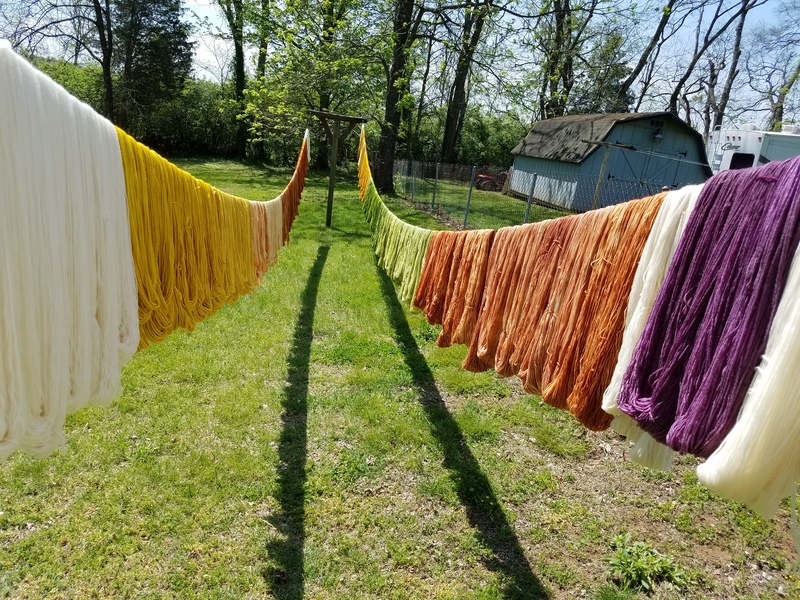 I am off to Allegan, MI in the morning for the Michigan Fiber Festival so my next post will probably be from there. Never a dull moment.